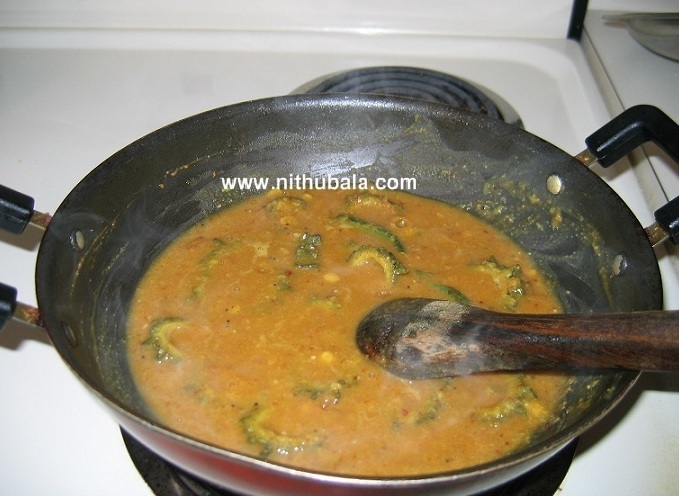 Pavarkaai pitlai is a traditional dish and I used to make this often at home. 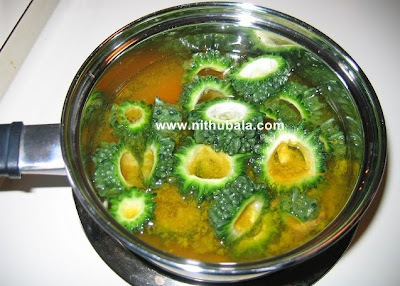 This is a healthy dish with bitter melon and less oil. 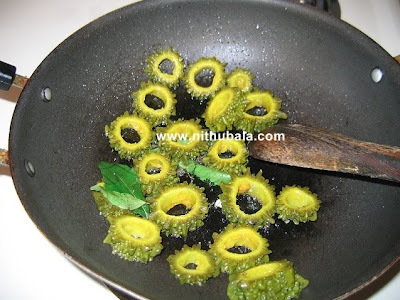 I know most of you would not cook pavarkaai (bitter gourd/bitter melon) because of it's taste. But this vegetable has lot of nutrients and it is considered to have high medicinal value. If you regularly consume bitter melon, you are sure to be away from lot of diseases. 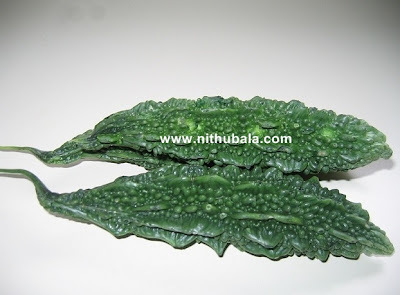 My mom used to cook lot of dishes with this vegetable. 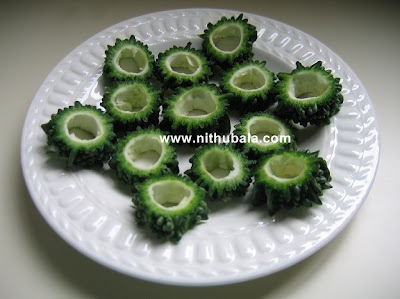 She also taught me how to reduce the bitterness in the bitter melon. If you really follow her steps, I'm sure you'l start to love bitter melon as much as I do. I have given the step-by-step procedure and hope you'l all start to cook bitter gourd and utilize it's health benefits. 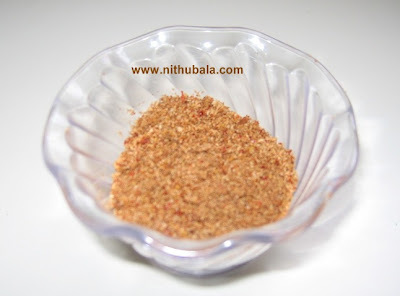 Dry roast all the above ingredients till brown and powder using small mixer jar. Keep aside. 1. Wash the bitter gourds and cut them in to small pieces. Remove seeds. 4. Meanwhile, cook both the dhals together. Mash and keep aside. 5. In a pan, add oil. Splutter mustard. Then add bitter gourd and curry leaves. Fry for a minute. 6. 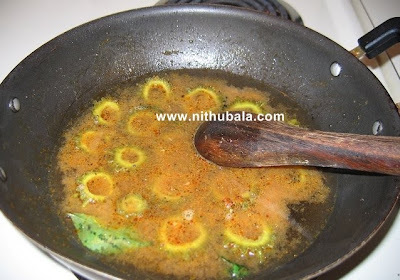 Add the remaining tamarind juice, salt and sambar powder. Cover the pan with lid and let the contents boil for 10 minutes or the raw smell of the sambar powder is gone. 7. 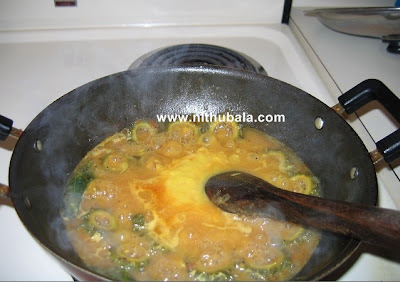 Now, add the cooked and mash dhal. Allow the contents to boil for another few minutes. 8. 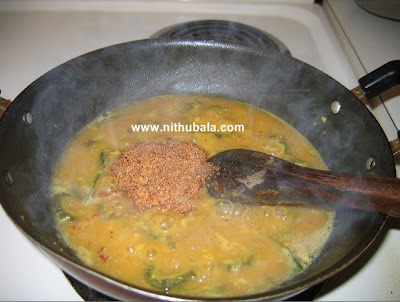 Finally, add the dry ground spice powder. Mix thoroughly. If you wish, you can add a little jaggery to enhance the taste. 9. 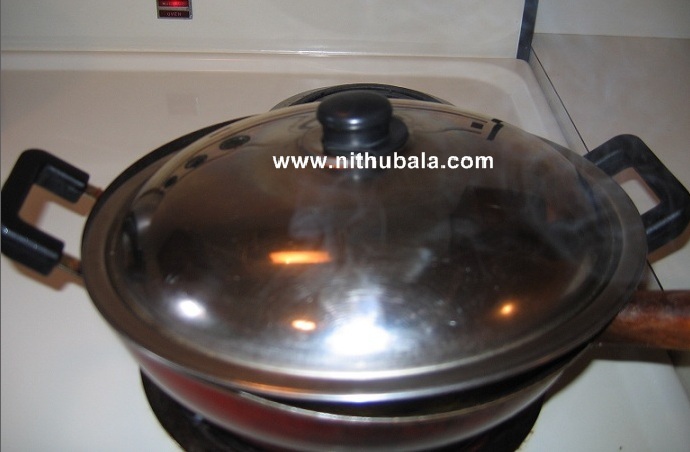 Switch of the stove when the contents get thickened. 10. Enjoy with hot rice. Nice illustration. Thanks for the tips to remove bitter taste of bitter gourd. 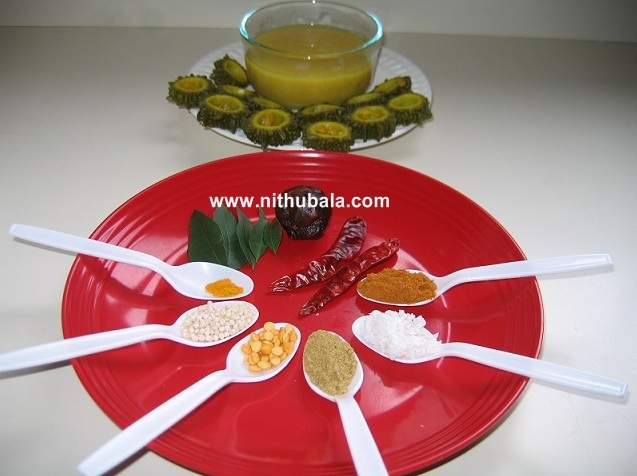 tempting recipe with step-by-step photos nithu..will try it soon. 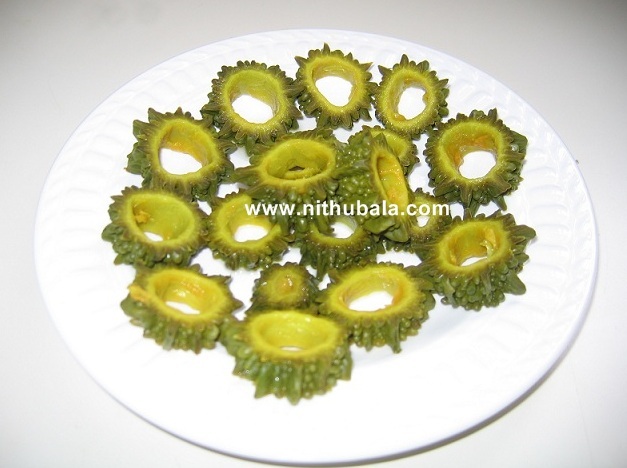 Looks delicious, its my husbands one of the favorite vegetable and i shall try it. looks delish nithu..luved the cute presentation..nice clicks ! 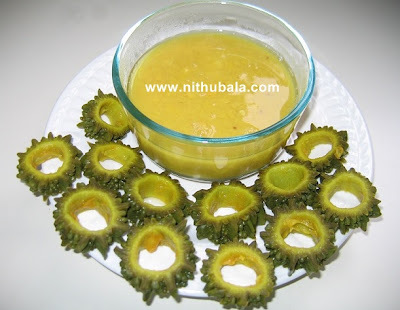 Not a big fan of pitali, but your pics are tempting me to make it! Pitlai looks very tempting and looks delicious.Love the way you have cut the pavakkai, looks beautiful.Thanks for sharing. my favourite dish well made !!! 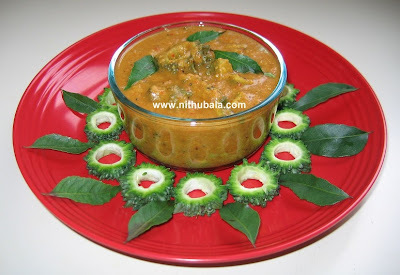 Favourite bittergourd pitlai, simply tempting!